It is with great relief and pride that state-sponsored slavery has been consigned to history in the West and in most other parts of the world. From ancient times through to the mid-20th century, enforcers of slave-based systems at times demonstrated the worst aspects of human nature. Despite America’s ideology of freedom and democracy for all peoples, the country started off with a terrible stain on its record due to the racially-aggravated slave-based system that was predominantly practised in the South of the country. Steve McQueen’s 12 Years A Slave brilliantly gives us a window into the harrowing world of the treatment black people suffered at the hands of white slave masters in the South before the Thirteenth Amendment came into force in 1865. Solomon (Chiwetel Ejiofor), as a free man, with his family in New York. 12 Years A Slave is based on the true story and memoirs of Solomon Northup (Chiwetel Ejiofor). Born and raised in New York as a free man, Solomon is invited by two ‘artists’ to share his skills with the violin and make some good money by playing in Washington DC. But after making some money in the capital, Solomon is drugged one night and wakes up in chains in a dank underground cell. Despite his protestations of being a free man, Solomon is shipped to the South and sold into slavery. Somehow, Solomon must stay alive, maintain his dignity, and return to New York to see his wife and two children again. 12 Years A Slave is a powerful, tear-jerking and distressing film from the off. Nothing by way of raw brutality is left out to illustrate how badly black people were treated under slavery. 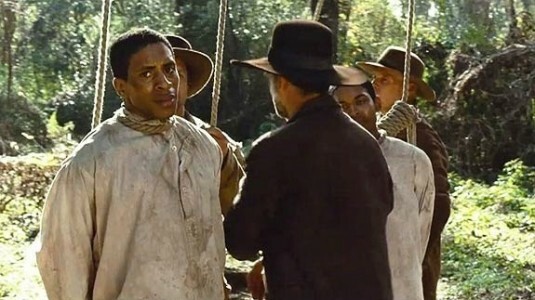 By starting the film with Solomon in slavery, having all his moments as a free man via flashbacks, Steve McQueen immediately enables audiences to sympathise and pity Solomon’s situation. Sometimes (to be really pedantic) in order to rub salt into Solomon’s sorrowful predicament, the film indulges itself a little. This has the dual effect of giving Solomon so much screen time that it is as if the world revolves around him (especially due to the fairly long scene sequences that McQueen favours); and it pads out the movie’s running time to 134 minutes by putting in scenes that have no material effect on the plot. But these minor criticisms should not undermine the effectiveness of 12 Years A Slave. Epps (Michael Fassbender), the nastiest of all the slave owners, shouting crazily at an enslaved Solomon, tormenting him. The movie, however, would only be half as potent if it were not for the great performances from all the cast members, but in particular from Chiwetel Ejiofor and Michael Fassbender. Ejiofor captures the anger and the despair of his character. Moreover, he portrays the sheer willpower of Solomon to survive with (some of) his dignity intact splendidly. Whenever Solomon looks back at the life that was taken from him, viewers cannot help but feel Solomon’s pain, and credit must be given to Ejiofor for enabling audiences to feel such strong emotions. On the flip side, Fassbender also makes viewers feel strong sentiments with his performance as Edwin Epps, the ‘N*****-Breaker’ as his character is proudly nicknamed. It would have been easy for Fassbender to fall into the trap of a pornographic nastiness (as Ramsey Snow from Game of Thrones and the villains in Hostel and The Human Centipede all gleefully jump into). But by Fassbender playing Epps as an eccentric and quasi-comical human being, with problems of his own, Fassbender provides us with a powerful performance of a sadistic, yet troubled soul that feels entirely natural under the circumstances. Fassbender can be seen to represent some of the worst facets of slave owners (and humanity in general when given licence). Nevertheless, 12 Years A Slave makes a point to show audiences that some slave owners were not as bad as Epps, and that they lived in fear of men like Epps and their own henchmen because of it. Black slaves hung for the crime of running away from their cruel masters, and to deter others from trying to do the same. Being afraid, of course, does not excuse keeping slaves or their actions. But as honest as the film is regarding the cruelty of the slave-system in the South, it is equally honest about why some people, who would have probably been good citizens in the free North, perhaps did not do enough (or anything at all) to help bring down the system. Steve McQueen must be applauded for this, like he should be for virtually everything else in this movie, as it would have been easy to inaccurately portray all slave owners as the Devil incarnate. Over-all, 12 Years A Slave can be best summed up in the words of one of the actors in the film: “amazing… and none of it good.” Through outstanding performances from the cast, the film powerfully reveals the horrors and brutality of the slave-based system in the South of America in the mid-nineteenth century. 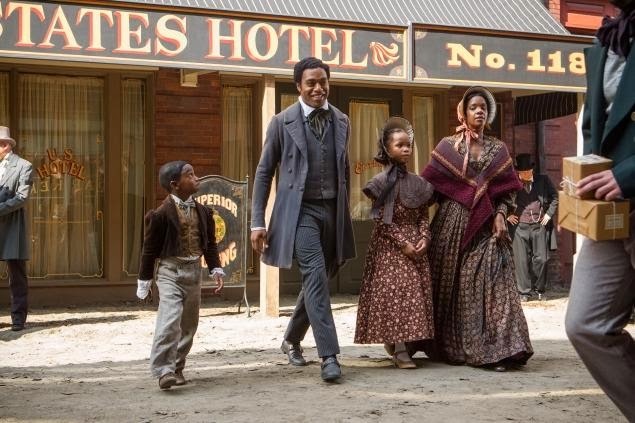 One is likely to leave the film feeling numb and distressed, but also with the knowledge that not all the slave owners were wicked and that good men like President Abraham Lincoln put an end to the reprehensible system almost 150 years ago. All democratically-elected state leaders, whether they are presidents or prime ministers, have an ambition for reaching their respective position. For some, it is about power and/or aggrandisement; for others, it is about putting their names down in the history books. But for an exceptional few, it is about being uniquely in the right place at the right time and enabling their ideologies and actions to make them stand out from among their peers. 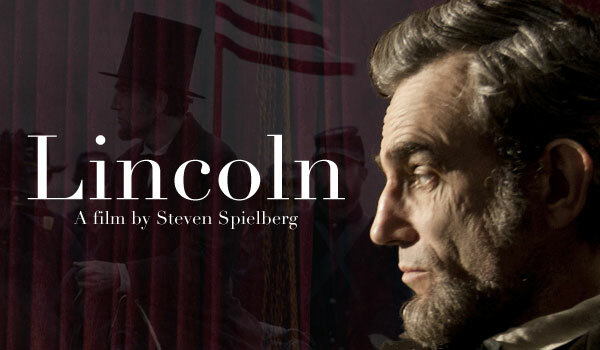 President Abraham Lincoln (1860-65) belongs to the last category, and Steven Spielberg’s admirable biopic, Lincoln, illustrates why this is the case. President Lincoln (Daniel Day-Lewis) forcefully telling his cabinet that he intends to proceed with the amendment and that they must help him. Lincoln revolves round events in America during January 1865. At the time, no-one was certain as to how long the Civil War (1861- April 1865) would continue. The Unionists, led by President Lincoln (Daniel Day-Lewis) and the armies of the north, are in a strong position. But the rebel Confederacy, led by Jefferson Davis and the armies of the south, are not about to surrender either. The latter’s resolve is further stiffened upon hearing that, despite the war raging on, President Lincoln intends to push through Congress the highly contentious Thirteenth Amendment (the abolition of slavery) before the legislature ends its session at the beginning of February. The Confederacy’s hatred of black people and their slavery-based economy cannot allow for it. But will their attempts to block the proposed amendment succeed? Moreover, the debates on slavery and freedom throughout Lincoln are intellectually stimulating. In the present era, it defies belief to learn that President Lincoln was a ‘radical,’ even among his key allies, for wanting the abolition of slavery. The Thirteenth Amendment was a measure that America (apparently) wasn’t yet ready for in 1865 (almost sixty years after Britain and France had abolished the Slave Trade, and four years after Tsar Alexander II had passed the emancipation of serfdom in Russia). However, one only has to read Harriet Beecher Stowe’s 1852 novel, Uncle Tom’s Cabin, to realise that Lincoln fails to illustrate the inherent racism towards black people that existed even among abolitionists. Similarly, the movie says nothing of the four Union states that permitted slavery, which is strange as those four states could have been portrayed as a thorn in President Lincoln’s side. Mary Lincoln (Sally Field) welcoming home her eldest son, Robert (Joseph Gordon-Levitt). Furthermore, the film only deals seriously with two issues: the amendment and the Civil War. While they understandably dominated Lincoln’s presidency, surely there were other matters for the president to consider, such as the annual budget and foreign relations? None of these are ever mentioned, which has the indirect effect of making President Lincoln appear almost two-dimensional. But to say that the ex-president was anything less than a highly-complex and gifted man serves to undermine him, and Daniel Day-Lewis exemplifies this with a performance of remarkable consistency. He captures the former president’s quirkiness, social awkwardness and witty humour fantastically, as well as his indefatigable zeal and reason for his ideals. Day-Lewis undoubtedly dominates Lincoln, but that does not mean that the supporting cast should be ignored. With the exception of Joseph Gordon-Levitt, who is average at best and whose role, as the ex-president’s son, Robert Lincoln, could easily have been shelved, Sally Field as the ex-president’s worrisome and frenzied wife, Mary Lincoln; Tommy Lee Jones as the savvy Republican Congressman, Thaddeus Stevens; David Strathairn as the cautious Secretary of State, William Seward; Jackie Earle Haley as Alexander Stephens, the racist Vice-President of the rebel Confederacy; and even James Spader, as the underhand Mr. Bilbo (no, not Baggins) are all superb. President Lincoln exploring the aftermath of a battlefield, knowing that his decisions have cost many Americans their lives. Equally good are the costume and make-up designs, which truly bring the 1860s to life. Likewise, John Williams should be praised for writing a soundtrack that does not sound remotely like Star Wars, Home Alone or Indiana Jones. Indeed, Williams’ score here is more subtle in nature. It adds a touching element to Lincoln that makes the movie that bit more poignant when it matters most. 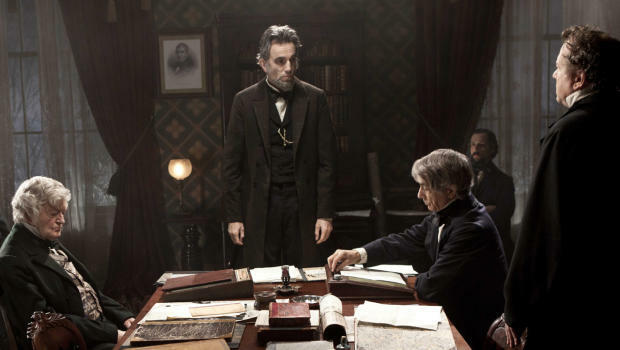 Over-all, Lincoln is a venerable film with clever dialogue, a beautiful set and enchanting acting. 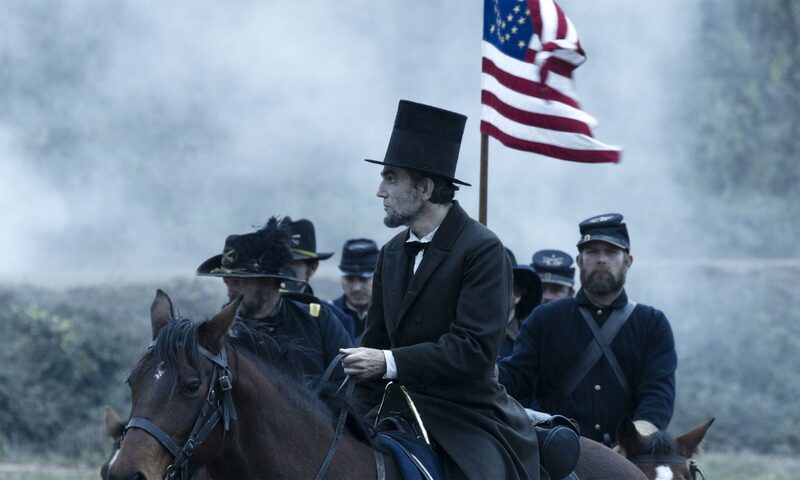 The movie might be a little long and simplifies some of the historical issues, but this should not negate that President Lincoln was one of the rare few leaders who have managed, almost single-handedly, to change the course of history. He understood the uniqueness of his epoch and acted upon his conscience, despite knowing the storm it would cause (as well as unknowingly making him pay the ultimate price for it). Lincoln demonstrates all of this wonderfully and shows us why President Abraham Lincoln is rightly regarded as the archetypal president that so many of his successors have tried (and often failed) to emulate.